Sometimes we have to dare… sometimes we have to jump in the unknown. 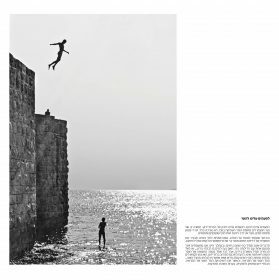 There are no manipulations in this photography of a young man jumping in the see from the walls of the old city of Akko, in Israel. There is enough depth under the water, but there is no way to be certain of it before jumping and experimenting. And the guy standing below on a rock just under the level of the see adds to the illusion of a lack of depth, and thus to the impossibility of jumping without being hurt. Thinks are not always as they seems to be, and during the path of our life we are all confronted more than once to this dilemma : shall we dare to enter the unknown … or not ? The choice always remains ours, but one think is sure : not to dare will result in no change. Daring to enter the unknown is like jumping in the see to discover, once under the water, a new world which is not possible to perceive from the other side … from the other side of the mirror. And once we “see” the other side of the mirror, the unknown cease to be. Ignorance becomes consciousness.